Rushed in for emergency surgery to stop bleeding on the brain, doctors at Matsudo City Hospital said the child was lucky to be alive. Others have come in with spinal fractures, broken ribs, and shattered limbs. Yet they are not young victims of violent crime in Japan, but children injured at school after taking part in kumitaiso (group gymnastics) class, an issue that has prompted angry parents and doctors to campaign for a ban, warning pushy teachers are putting children's lives at risk. Across the nation, more than 8,000 kids annually require medical treatment after taking part in the discipline, which sees students work together to contort their bodies into human pyramids and towers, according to the latest figures from the Japan Sport Council. The worst cases have resulted in brain damage, spinal injuries and internal bleeding, and on rare occasions, even death. 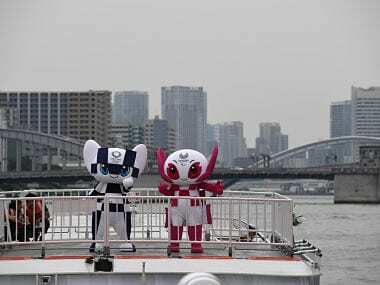 "If you get hurt when you can't assume a defensive position, you can get a serious injury even if the height (of the formation) is low," explained Tomohisa Shoko, head of emergency medical care at Matsudo City Hospital in Chiba, which has seen a stream of serious kumitaiso-related cases in the past three years. "Some children have broken ribs and breastbones -- those are rarely seen injuries even in other sports," he added, explaining how one sixth grader needed brain surgery after falling on his head after taking part in the discipline. Recently, he operated on a 15-year-old who had internal bleeding and a broken leg after attempting a human pyramid during sports practice. Shocked by the injuries he has seen, Shoko is now calling on educational establishments to ensure children are better protected. "A doctor alone cannot deal with safety issues," he said. Kumitaiso has been a mainstay of annual school sport festivals and is taught as part of the physical education curriculum to encourage teamwork and endurance. But parents and lawmakers argue schools are increasingly putting competition before pupil welfare, claiming a desire to best rival schools by creating dramatic displays has turned tradition into a circus. "There is a tendency to compete over the height of pyramids," said Ryo Uchida, professor of sociology of education at Nagoya University, noting a recent case of a six-tier pyramid at a kindergarten. 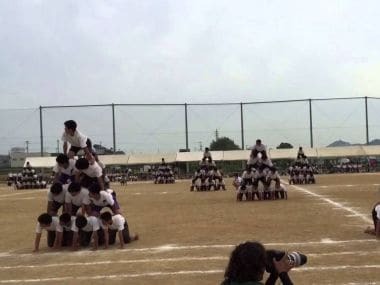 In September, six students were injured as they attempted a 10-tier human pyramid, which collapsed during a school sports festival in Yao in western Japan's Osaka prefecture. The incident caused top-selling Yomiuri Shimbun daily to run an editorial warning: "People point out that it is the teachers who get a sense of achievement, but not children." Some parents agree the desire to impress -- particularly in the video-sharing age -- is making teachers and coaches negligent over safety. "If schools don't do their job, who takes responsibility?" asked the mother of one little girl, who was knocked unconscious after her classmates fell on top of her when the formation they were practising collapsed in 2014. The child, who can only be identified as M, was just 11 at the time. She was revived and taken to hospital after shattering the bones in her arm. "She could have lost consciousness forever or even died if her head had borne the force of the collapse," her mother told AFP. There have been nine deaths linked to kumitaiso since 1969, when JSC records for school sports injuries began. "In many cases the risks are being ignored," Uchida said. He has launched a petition, already backed by thousands, calling on education minister Hiroshi Hase to regulate kumitaiso formation size. It often takes a serious incident before schools or authorities take action. Yao's board of education is considering a ban on kumitaiso, after public outcry over the September accident -- which was filmed and posted on video-sharing and social networking sites. In M's case, she says teachers ignored a light injury to another child, before she was seriously hurt, and continued to push pupils to take part in the sport, citing its importance for "kizuna" or bonding. The school banned kumitaiso after her accident but neighbouring ones continued, resulting in at least 17 injuries in 2015 in Tokyo's Kita ward, according to the local education board. The ward in March decided a ban on kumitaiso, following Tokyo Metropolitan Government's decision to stop it in some 250 schools it directly runs. 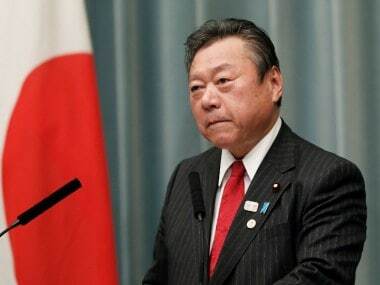 In February, Hase, a former Olympic wrestler, made a u-turn on his previous stance on kumitaiso safety, calling for vigilance ahead of the school festival season, starting in May. 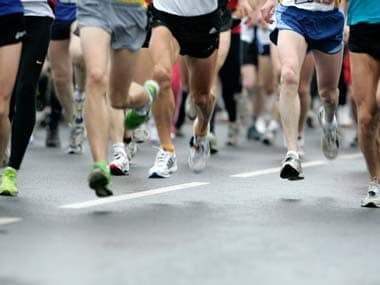 The Japan Sports Agency, under Hase's ministry, has since issued a notice to education boards nationwide to halt the practice if "safety cannot be guaranteed". School resistance, however, appears to be a key obstacle to tougher measures. "We didn't impose a blanket ban because some teachers argue there are educational aspects to kumitaiso," JSA official Fumiki Agata told AFP. The inaction has left M's mother enraged, and questioning whether Japan is fit to host the Tokyo 2020 Olympics when it is "ignoring the risks of serious accidents" and child injury in school sport.